2013 was a good year for drinkin'. We investigated boozy superstition, we traveled the earth to see how your favorite spirits are made, and we drank cognac out of a bone. We had a great time, and we were glad you came with us. 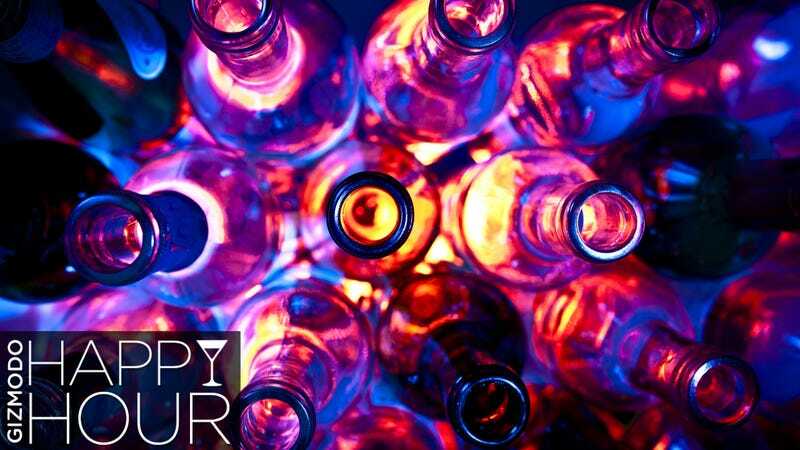 Here now are our favorite Happy Hour episodes from 2013, including some you might have missed. Can Drinking Cure Your Cold? There's a lot of nasty, virulent bugs going around this year. Colds and flus are putting people out of commission for weeks on end. This means that by now one of your friends has told you to drink some whiskey because that'll knock the cold right out. Some people swear by it. But is there any scientific evidence to support that (admittedly fun) hypothesis? Let's see. "Fire is cool," quoth Beavis, and yea verily, Butthead did agree. And, honestly, so do we. There's a little bit of a pyro in most of us, and a flaming drink is certainly a spectacle. That said, there's a right way, and a whole lot of wrong ways to do it. Here's the red hot skinny. Do You Really Get Drunker at High Altitude? There's a phrase people like to repeat in Denver: "Be careful when you drink here." The claim is that the altitude (elevation 5,280 feet) makes one drink between 1.5 to 3 times as potent. If you visit the area to ski this winter, the city officials will even warn you about it when you get to town. Is there any thing to it? Do you want a beer, or do you want a cocktail? The answer is yes. You want both. Right now. Simultaneously. In a single glass. Today we're going to show you how to turn your old favorite beer into your new favorite syrup, and how to use it in a cocktail. Think you can only make whiskey from rye or barley? Think again. At least at Brooklyn'sKings County Distillery, they've made the spirit with some crazy components. When Gizmodo stopped by for a visit earlier this week, we spent a fascinating day with co-founder Colin Spoelman as he pulled some transubstantiating magic and turned Coca-Cola into whiskey. Dippin' Dots, the momentarily dead but then thankfully resurrected novelty ice cream, are fun to eat. But the flavors are, well, a little childish? Wouldn't you rather make dots that taste great and help numb yourself to the world? Of course you would. Right this way. We are officially in the dog days of summer. Here in New York it's brutally hot, and the air has the consistency of bath water. You need something refreshing. The Greenhound is that something. As the name suggests, there are really only two components to a gin and tonic (unless you count the lime), which means only two ways to screw it up. It's easy enough to avoid a bad gin. Bad tonic water, though, is the rule, not the exception. Look at a label and you'll see cheap high-fructose corn syrup is the first ingredient in almost all of them. There's a better way. If you've ever worked in an office you probably know the ubiquitous K-Cup machine, made by Keurig. It quickly and painlessly dispenses single-servings of the hot beverage of your choice. Even, it turns out, if that beverage is 100-proof. We just happened to have one of these discarded machines lying around, and decided to see what would happen if we used it to make hot, boozy deliciousness instead of boring ol' coffee. Game on. Tequila is a much-maligned spirit here in the United States. Most of us think of it as something so nasty you need to do it in a shot with salt and lime so that you'll taste it as little as possible, or take it mixed into an over-sweet margarita. All of that is changing.